In "Waiting for the Light," Jake Abrahamson follows the journey of Ritu Raj Verma as he attempts to bring portable light through lanterns to India. According to Verma, Indian villages like Jangaon are completely stagnant with the sun goes down and they are without electricity to provide light. Both Abrahamson and Verma work to provide accessible light to rural villages in India. This article details the hardships and history as to providing light to the villages is difficult. 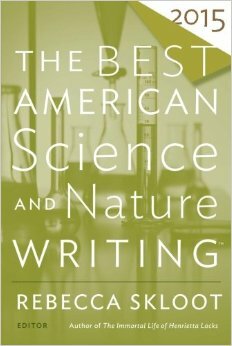 The article was selected by Rebecca Skloot as one of the "best" science and nature writing pieces for 2015. In brief, what do you think led her to view Abrahamson's article as one of the best? In "Waiting for the Light", it was hard for me to even conceptualize that 400 million people in India are still without a modern form of illumination. In America most everything we do requires electricity, yet many villagers are still using kerosene wick lights. What's even more compelling is despite the efforts of the OMC, there are still light pillars that have been up for four years, but have no form of electricity running through them. I believe Rebecca Skloot viewed this article as one of the best because it is written with great descriptions and dialogue. This article told raw and true stories about how people live in villages with no light and wait years upon years to get some form of light or electricity. The article also did a good job of explaining the processes the companies go through in order to get the lanterns delivered to the villages and how big of an impact that they are making on these villages. I believe that Skloot chose the article, "Waiting for the Light" as one of the best because, although it gives scientific information, it reads like a novel. The writing is not boring or extremely academic and so the information can be understood and enjoyed by more people. The article is very descriptive and makes the reader feel like they are there and can see what the author is seeing, like when Abraham says, "the sky above northeast India looked like Mango skin". This kind of writing makes this scientific article much more accessible to the general population. At the end of the article Verma was trying to make sure Jake Abrahamson was paying attention to the world around him. There was no light yes, but there was a community. He told him that this a village. They don’t need machines to do things for them, they can do for themselves. Verma was trying to show Jake that he did not need the finest house to be happy or to have all that machines come with, but to be happy with what you do have. He wanted him to understand that you may need certain things, in this instance light, but you don’t need much. With that being said that’s why Skoolt views Abrahamson’s article as one of the best. It taught a lesson of appreciating what you have and understanding. This article taught the lesson of appreciating nature- the Indians doing as long as the sun is out- and also understanding the need for science- lights. I think Rebecca Skloot named this as on of the best science and nature writing pieces of 2015 because the article is truley about science and nature, how they go hand in hand and their effects in the day to day lives of the population of Indians without power,and electricity. I think Skloot saw Abrahamson's article as one of the best, because it expressed a village's desire to advance in science by having electricity. The article illustrated the struggles the village face by only using sunlight and lanterns, but a significant struggle was that "India's grid routinely suffers 30 to 40 percent power loss between the source and end users"(4). The article also went through India's government's plan to utilize solar energy to overcome the grid issue and bring electricity throughout India. I believe Skloot viewed Abrahamson's article as one of the best because writer took on many different perspectives on the issue of light in India. The writer writes from the perspective of being in India experiencing for himself the lack of lighting. However, the writer didn't just go to India to report on the issue, Abrahamson made connections with the local people to get their thoughts on the situation. I believe Skloot valued the connection and empathy Abrahamson had for the people of India as well as the research, which is why she thought "Waiting of the Light" was one of the best. I believe that this was chosen as one of the best because of the true and raw nature of the real story being told. It went extremely in depth, such as the fact that so many people in India don't have access to lights. Given the fast economic growth of many places, it is troubling to know that not everyone in the world has access to the same resources and privileges. It was also written with great description. I would have probably chosen this article as best for one reason. The reason is that we do not realize how blessed or lucky we are to have what we consider as daily basic needs. While we complain when the wifi is bugging, some people wish to simply have electricity. One passage in the book say: " He wakes and sleeps by the rise and fall of the sun. When night arrives and Aat gets dark the Verma family goes to bed for lack of anything else to do." (2). This precisely looks like being sent to bed early because you have class the day after even when you are not tired. It must be awful. Another aspect that attracted my attention is the fact that some villages in India use kerosene to light their lantern. As mentioned in the book, it causes respiratory diseases and might start a fire in moments of inattention. I have heard people dying because their houses burned down due to candles. I cannot imagine how horrible those fires would be adding kerosene. This article reminds me to be grateful for whatever I have now. I believe this article was picked as one of the best because the extreme amount of detail the author goes into.He also tells it from personal experience which I believe gives the story a raw and powerful telling of the struggle. The author also goes into detail about the steps the government needs to take in order to get the country the necessary lights. I believe this article was picked as one of the best because of the level syntax and imagery within such a short passage. The author uses very descriptive words to describe the dark and the way people live. "This is the darkest place I've ever seen" (page 2). The author does an a excellent job of describing the surroundings as well as the contrast of the values of Americans and Indians. I believe this article was picked due to a collection of things. Not only is the article not boring, so it reads well. But, it also truly shows the relationship between science and nature. The author did a fantastic job of explaining everything and showing his connections between the people that live in the village. There were many aspects to the passage that I believe led Mrs. Skloot to selecting, "Waiting for Light" as one of the best passages. The main reason I believe that it was selected is because it makes the reader think less myopically. There are a plethora of people today that forget there are parts of the world that do not have access to aspects of life that many of us find common. Something as "simplistic" as electricity is still not available around many parts of the world. For example, in the passage, one of the men riding along stated that the village was, "the darkest place he had ever been." Also, there was a man from from the village that did not understand the concept of 24/7 electricity. All in all, there are just many things in this world that people are unaware of, and the accessibility of electricity is one of those things. It just so happens that in India the case is more severe than most, which lead to an amazing story with quite interesting facts. I cannot imagine not having working electricity. The extreme amount of detail the author goes into to write about how the dark was and how it affected the people in the village sent shivers down my spine. India is such a gorgeous place and we never really seem to see what some people have to go through. I think that Skloot described the article as the best because of the amount of detail and willingness portrayed through the use of the writer's words. The author of the excerpt doesn't make a claim/statement and stay vague. He thoroughly explained the issue of no electricity to the village and how there is an ongoing solution. In my opinion, I believe that Skloot described the article as the "best" due to the fact that the article thoroughly described the issue that is at hand in Indian villages. Not only did the article describe an ongoing issue, but it also presented a resolution to this issue. Due to the description of the issue of no electricity that Indian villages are undergoing, I was able to feel sympathetic for the individuals. The article had an emotional appeal to the audience because we are able to become aware of the privileges that some of us have, that we do not even consider privileges for the most part. The fact that the article also provided a resolution in order to fix this issue, gave me the realization that there is hope for these underdeveloped villages. Overall, the article was definitely an interesting read and I would agree with Skloot when describing it as the "best". Skloot choose this article as one of the best because of the rare content of India shared through incredible and descriptive details that the author gave the reader. Its crazy to me that people still don't have electricity, but its also crazy to see that some people are happy and cherish the things that they have rather than let what they don't have determine their happiness. I think Skloot also picked this article as one of the best because its opposite of the norm. In America, we feed off of electricity and have a nervous breakdown when our internet is not working right, but that's not the case in India. It shows the life with no electricity at all! I believe that Rebecca Skloot choose “Waiting For Light” as one of the best science and nature writing pieces because of how the way that Jake Abrahmson tells the story of how the people in India are without light and how they have to use lanterns as a light source after the sun goes down. It tells a story that most Americans wouldn’t be able to understand the depth of because they have never faced those troubles. I think all of these factors and many more are why Skloot chose this as the best science and nature piece. In my opinion I think that she choose this as one of the best articles because it focuses on such an important topic. It also shows that there is such a disconnect between people and what they value the most. The other of "Waiting for Light" describes the hard ships of the people in India. These people don't have the basic needs of electricity and yet they are still able to cherish the things that truly matter in life. The other explains their situation in such great detail that it gives the reader a perfect picture of what they are supposed to take away from the article. It shows that people in the U.S. value electricity more than things like their well being. While people in India are valuing things a little differently. I think this article was named the best because, not only is the topic important, but the author used great description in describing the village that these people lived in. The village that the author wrote about did not have the objects that we would consider necessary in our world today. What stood out to me, and played a major role in this article being called the best, was that the people in this village were able to take what they had and make the best of it rather than focusing too much on what they didn't have. I think that this was chose as one of the best passages because of how well written it is. The way the story is told makes it easy to imagine what the people went through without light. It tells a story that most wouldn't be able to understand. Portraying the message through a personal experience also makes it raw and people can feel more when someone is telling a story from first hand experiences. I think these are the reasons why it is chose as one of the best. I enjoyed this article because it was very eye opening. Many people not just in Indian villages face problems like this. As someone who grew up in America it is hard t believe not having light and electricity. However, the depth and details used almost made me feel like it was my life. With not having light though, it describes a sense of community that many of us in developed countries don't need. I believe that Rebecca Skloot chose "Waiting for the Light" as one of the best because of how the villagers were able to come together and make do without having electricity. The people of the village came together in a way we do not usually see in today's world. On page eight, it is written how the villagers always give the best they have. This made me think about their sense of community and how they essentially found "light" inside of the darkness. That's amazing. I think the article was selected as one of the best because, it shows the impact that science has on nature. As we know today, science has made living on earth so much easier through discoveries and inventions. However, everyone doesn't experience how helpful science is. It's hard to believe that "roughly 400 million of India's 1.2 billion inhabitants lack access to electricity" (2.) It is sad to know that they cannot operate in the dark, or have all of the luxuries that the US has. The article is very informative about what the Indians have to go through and about how difficult it is to bring electricity there, which is why I think it was selected as one of the best science and nature articles. This is selected as one of the best articles because it was very descriptive of how much light was available to the Indian public. It felt like I was living there with them, but growing up with light practically everywhere made me realize I could never fully understand how difficult it must be. One of the details displaying this early on in the article was that they use kerosene wick lights that give off "the illumination of a birthday candle" (pg. 2). However, I enjoyed reading towards the end of the article that they are coming together as a community to provide OMC lanterns for the well deserved population to have access to simple stuff (such as water at the water pump) during a dark hour. I think what led Rebecca Skloot’s view of Abrahamson's article as one of the best is due to the amount of detail written about the process of trying to bring light to a city that was severely under resourced. I also think it’s important to point out that the author cohesively mixes emotion and life stories with science to make it a great read. Mara B.
I believe Rebecca chose this article as one fo the nest because it had many great details about the daily lives of the Indians. You are able to easily imagine yourself as if you were a part of the community of villagers. It is also a very informational because the article shows how the people were able to live without what we think are basic necessities like electricity. I tried ti imagine myself in that situation and if I would even survive. I that Rebecca Skloot named Abrahamson's article as one of the best because he not only examined the issues of light from what he saw and experienced while in India, but he also showed how the lack of light impacted the locals and the hardships that were brought upon them, due to the lighting issues. This article gives immense detail and allows us to truly visualize and connect with the material in this article. I believe Rebecca viewed the article as one of the best because of how compelling the topic of the article is. The idea of not having something so important as light is subject that Rebecca viewed as the best and the way Abrahamson was able to capture the idea of what he wanted to say in that way made it an even better article I feel.